If you're moving house, you'll have quite a few electronics to move. One of the most expensive things you own outside of your house and car is probably your TV. With televisions getting bigger and more expensive, the good news is they're getting lighter and easier to move despite their size. Long gone are the days of heavy box televisions that required four people to move them. While they're getting lighter, the fact that they're gigantic makes up for their weight and can be more awkward to move. But to ensure they arrive at your new home without breaking or anyone getting injured, follow these instructions for moving your television safely and effectively. 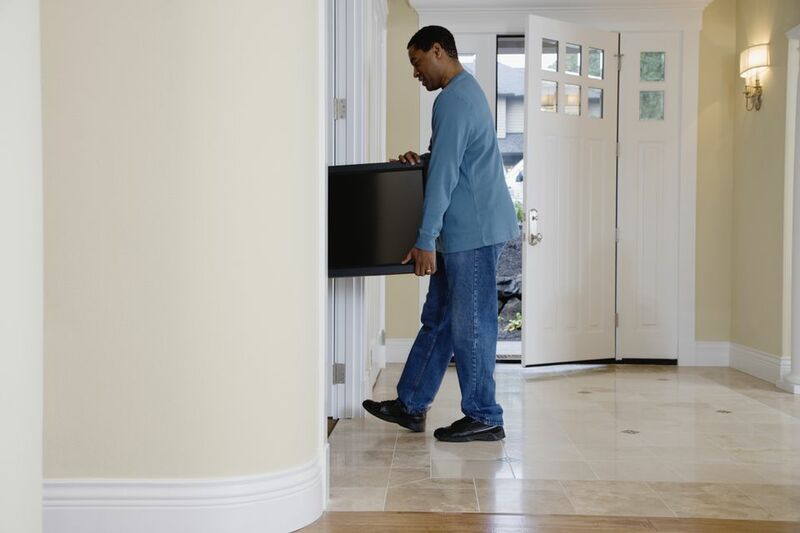 While it may seem obvious, it's important to make sure that you have enough help to move the television. They're much heavier than you might think, and because they can be quite fragile and because of their size, it's best to have some extra hands around to not just help lift but to direct you as you move it from your home onto the moving truck. You're going to need furniture blankets or pads to protect your television from bumps, scrapes, and fingerprints. You can rent blankets and padding from a moving company or truck rental agency. You'll need to also have strong packing tape on hand to secure the blankets or pads around the television. I suggest renting a few pads or blankets depending on how large your television is and the size of pads or blankets available from the moving company or rental shop and whether other furniture will require protection. A moving company or truck rental shop will rent moving equipment so if you're moving by yourself, a moving dolly is a good investment to make to move heavy appliances or awkward furniture. Along with the dolly, you can also rent moving straps that may make it easier to move your big screen TV. Moving straps can be used to secure the blankets or pads to the television and to also provide handles for you to use to hold the screen while you move it. Using straps will depend on the weight of the television and how awkward it is to handle. Using padding or blankets, which is needed to protect the unit, will make it more difficult to hold onto. Place the padding or blankets on the floor. Set the television on top of the padding, standing in its usual position, then carefully wrap the television like you would a big present. You'll need a few sets of hands to keep the blanket or pad snug while someone else secures the padding or blankets with packing tape. Make sure you don't secure tape directly on to the TV; this could damage the screen. Attach the straps according to the instructions and make sure that the two people doing the lifting are capable of holding the weight. Keep the television in its upright position as you lift it. Don't ever lay the screen flat on the floor—it should always stay upright and try not to tilt it too much as that can ruin the electronics. Once you've loaded the television on the truck, make sure it's in a safe place where it won't move. The best place to keep it is against the back wall of the moving truck or against a side wall. Pack large piece of furniture around it—things that won't shift during the move. As long as you wrapped the television securely, it'll be protected from bumps. Just make sure you keep box corners and other sharp objects away from the screen.